We were looking for evidence of a bank robbery but only found a freshly washed pair of underwear and socks hanging in the motel bathroom. Who did they belong to and why did she come back for them? Styx, Lady 1973. I would sing along with so many of their hits growing up, Lady, Babe, Come Sail away, Mr. Roboto, Too Much Time on My Hands to name a few. She certainly wasn't the lady I used to sing about. 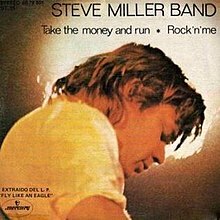 Steve Miller Band, Take the Money and Run 1976. I am not sure what the note said exactly, but I pictured it was something about money. Great song about a couple who rob a bank.